An impassioned and impressive core rhythm section lay down a sensitive and swinging magic carpet for Helm to soar, she works her moving velvet soprano as it weaves its spell – forged in the aching embers of Billie Holiday and Abbey Lincoln. "The difficulty of literature is not to write, but to write what you mean; not to affect your reader, but to affect him precisely as you wish." Literature and butterflies are the two sweetest passions known to man." Writers and poets. Composers and griots. These entities inhabit the same sacred space on this, the sixth offering from Lenora Zenzalai Helm, I Love Myself When Iʼm Laughing, and then Again When I’m Looking Mean and Impressive. Her formidable arsenal of vocal jazz abilities derives inspiration this time from Helm’s love affair with writers: fiction and non-fiction (Zora Neale Hurston, Donald Neal Walsch, Alice Walker), speechwriting (Robert Kennedy’s ‘Ripple of Hope’ speech), poetry (Rudyard Kipling, Sam White), biography (Gene Santoro, Ross Russell), and of course, musical composition and songwriting (Ellington, Coltrane, Mingus, Joni Mitchell). Less formerly trained writers also figure prominently, emanating from the African American oral tradition which is known to pass stories and knowledge to the next generation of seekers and believers. Two fellow Chicagoans, jazz griot Donald “Poppa” Meade, and Helm’s maternal grandmother, a pioneering entrepreneur and cosmetologist, Helen Graine Faulk. Helm speaks fondly of the two; the former, an octogenarian who has total recall over personal conversations and events in encounters with legendary jazz musicians, the latter, now deceased, a powerful influence in her community in Chicago’s South Side. Any deep appreciation for writers and what they do is probably the greatest evidence for one being a writer, oneself. Three of the selections come directly from Ms. Helm’s Journeywoman Suite, eleven pieces written as a result of winning the 2004 Chamber Music America/ Doris Duke Foundation’s New Jazz Works grant for jazz composers. These compositions contribute to the range of emotions being expressed here that are sometimes bawdy, sometimes hopeful, insistent, playful, reverent, and bluesy. 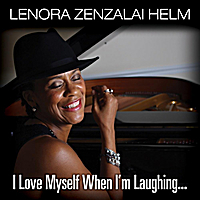 I Love Myself When I’m Laughing is a barefoot walk around the human experience and the tour guide, Lenora Zenzalai Helm, makes us listen, ponder, swing a little, listen and then swing some more! Grasping all the nuances, colors, and details of this well-crafted work takes time. It is a treasure that must be listened to over and again and as Henry Miller suggests, you will forget yourself.